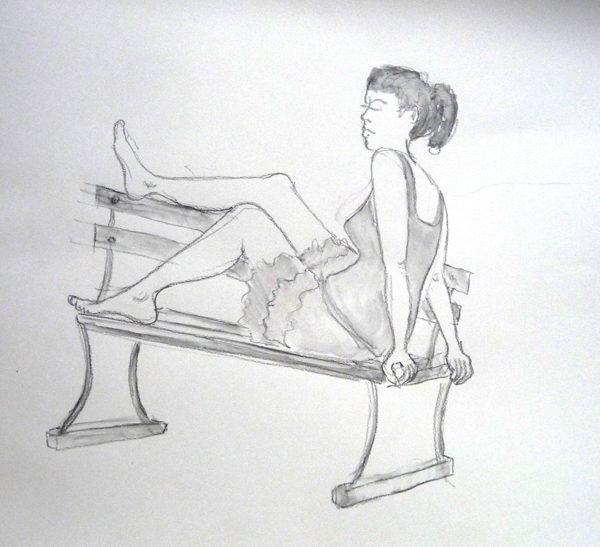 Between my Figure Drawing Class at FIT and our summer Figure Drawing in Battery Park City, I sketched 32 figures this past week. And my friend Pat and I spent one morning gallery hopping in Chelsea, and a full day yesterday between the previews for the Contemporary Asian Art Auction at Christies and the preview of the Interglobal Woven exhibit at the Metropolitan Museum of Art. I feel so enriched by all of it and wish that I could have my favorite moments going through my head in a slideshow for the next week. 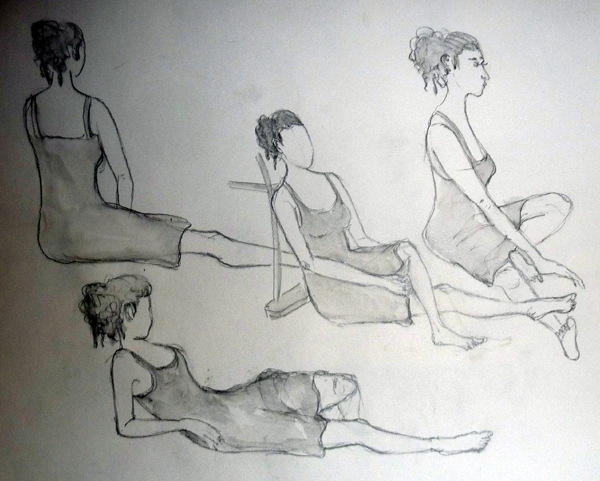 These are my two 20 minute poses - done on 18 X 24" paper, at an easel, at FIT. The remainder of the drawings were from Battery Park City - where it was 96 degrees in the shade and a heat index of 103 degrees. Did I capture the pouty, whining look of our model? She just wanted to sit, and therefore I had more opportunities for these poses than ever before. 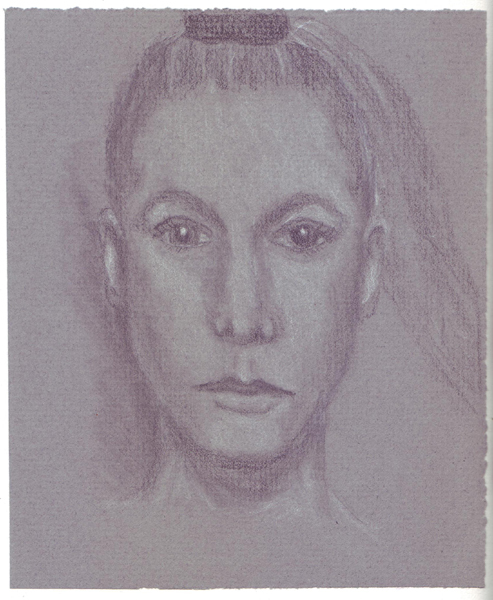 Multiple images were drawn on a large sheet of paper with a Derwent Medium Wash pencil and then "painted" with clear water. These were all photographed - with difficulty! 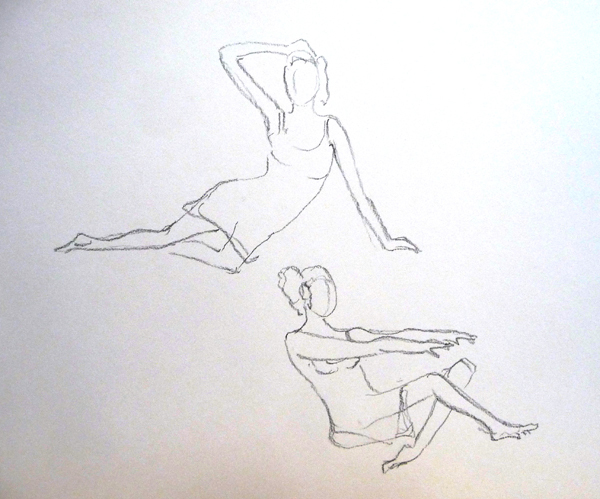 1 Minute Poses: I am most pleased with these. 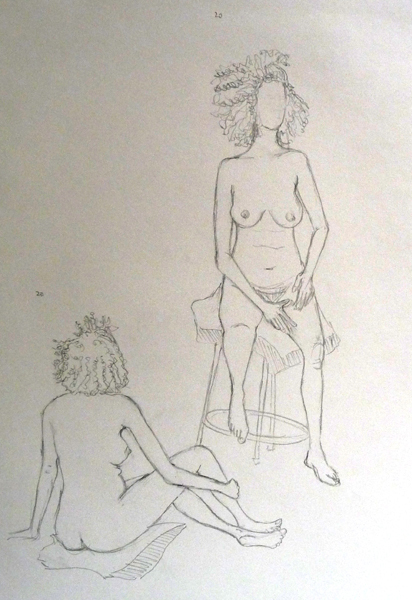 When I first started drawing figures, I could barely get one line drawn in 60 seconds. My Bookbinding Structure for September is suffering while I concentrate on figures - but it is Flexagons. I had never heard of these books, and now that I'm reading about their history, I'm getting more excited. I made a Square Flexagon and still have 3 more types to make: a Tetra tetra flexagon, a cross flexagon, and a hexa hexa flexagon. Don't they sound interesting?? As part of my September initiative "to shake up retirement," I also returned to ballet class after 4 years. I danced on and off my entire life and managed to find time to take classes even when my schedule was full. My body needs the stretching even more, the older I get - so off to ballet class I went. 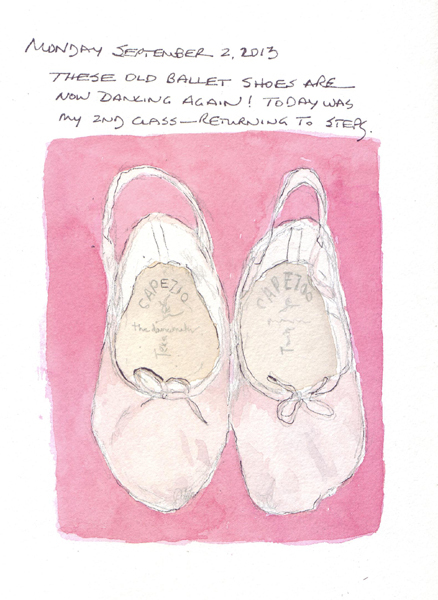 Here are my "oldish" ballet slippers, just to commemorate my first few classes. Last week was last week of my grandchildren's summer vacation and I took Sydney to MoMA on Tuesday and Zachary to the American Museum of Natural History on Friday. Syd and I sketched, had lunch, and then came home to do some sewing. I drew a few details from paintings included on the children's audioguide while she was listening. She also sketched a few details and painted them during lunch. 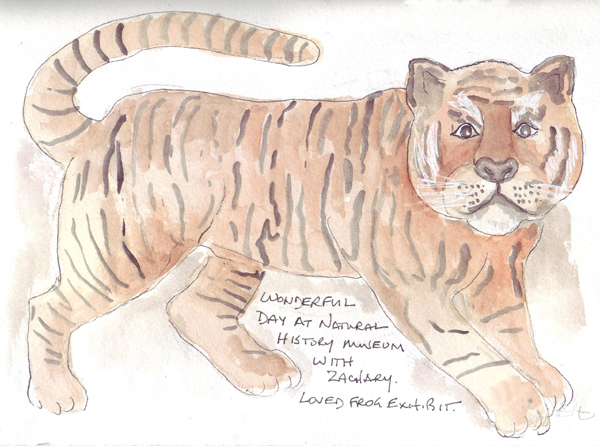 While my husband took Zach to see the big blue whale, I quickly sketched a beautiful tiger at Natural History and then painted it at home from a photo. Yesterday my husband and I spent the morning at the Café at the Conservatory Water - one of our favorite morning walks for coffee in Central Park. 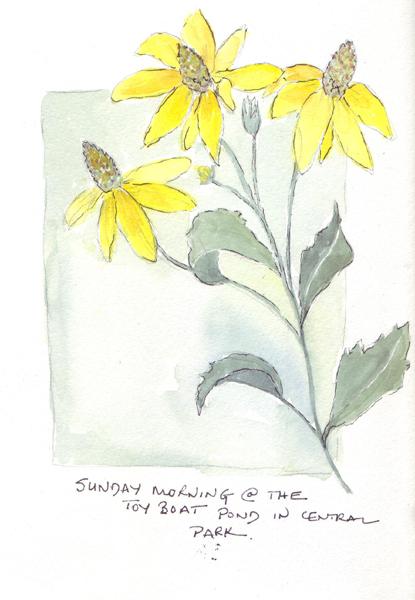 I sketched cone flowers - first painting them and then adding pen. 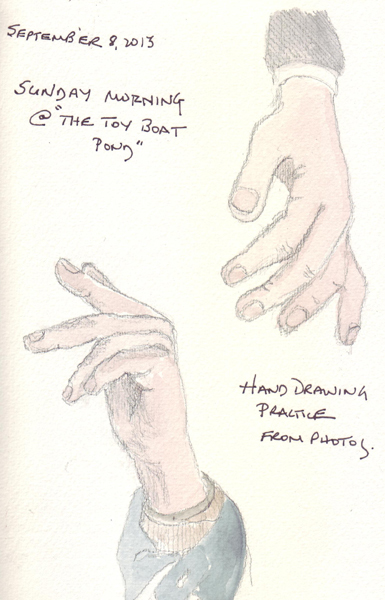 I continue to play with this technique after liking the way Reginald Marsh used it in the exhibit Swing Time. Tonight is my second Figure Drawing class at FIT and I will be doing longer and longer poses as the semester proceeds. I will need better hand drawing skills and used a photograph to draw these two hands. 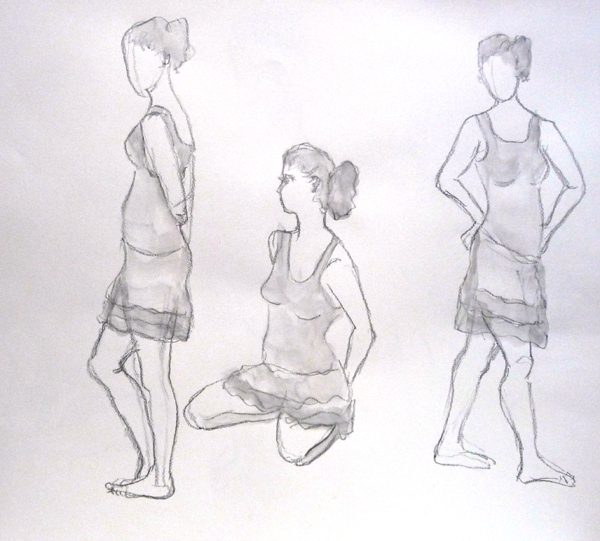 The weather was perfect on Wednesday and Judy, Pat, and I all went to figure drawing! 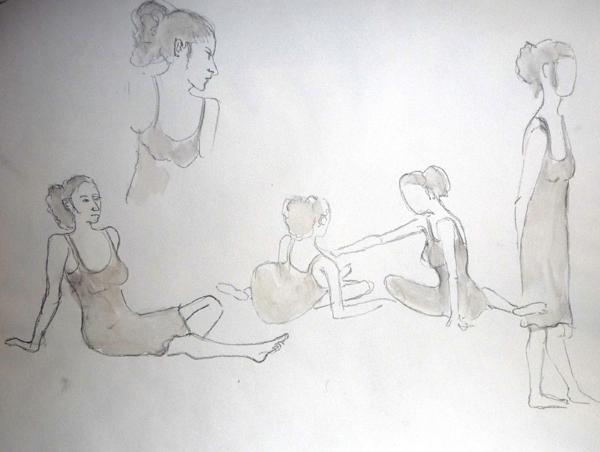 Here are a few 5 and 10 minute sketches, and one 20 minute sketch, using a General Sketch and Wash pencil. I love to draw from the Masters and try to analyze paintings and drawings during my museum and gallery visits here in New York City. There is a new exhibit at MoMA, called American Modern: Hopper to O'Keeffe. All paintings, drawings, sculpture and photographs are owned by MoMA and curated for this specific exhibit. I loved several of Charles Burchfield's paintings and especially a painting called The City, 1916. It was such a lovely loose architectural painting, that I was hoping that I could, sketch it, paint it, and try loose paintings like this is the future. 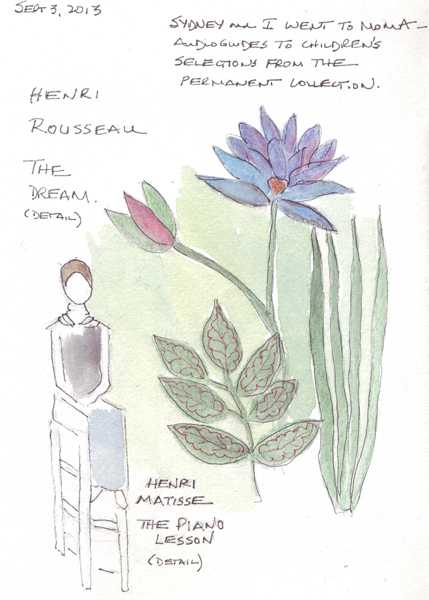 I sketched a portion of the painting in the museum and then painted it at home from a photo that I was allowed to take. My husband and I saw a Reginald Marsh exhibit, called Swing Time, at the New York Historical Society last week, right before it closed. I've always loved his paintings of New York City - especially those with a subdued palette. I was fascinated with his use of ink, and I think thin paint/tempera lines, to delineate his figures. 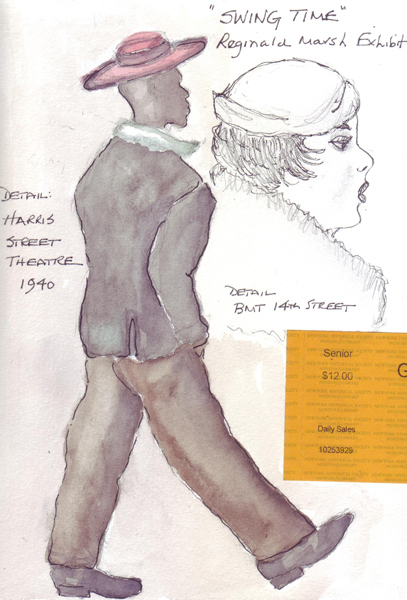 I sketched one from Harris Street Theater, 1940, so I could paint the figure and then add ink. 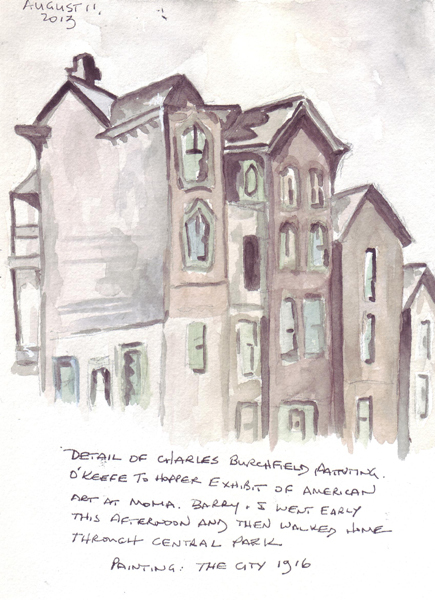 I also liked the woman on the far right of BMT 14th St. and just needed a drawing of her head to remember her. I watched the Videos in Stephen Cephalo's Strathmore Workshop and then tried his techniques using 9B graphite and white charcoal on toned gray paper. I used a photo reference for this very experimental drawing. I am taking my very first art class since 10th grade in High School - and was very nervous about it. Did I really want to "study" art in a classroom as opposed to learning on my own? Did I want to have a 3 hour class every week from Aug through Dec? Fashion Institute of Technology (FIT) has a senior scholar program, and unfilled classes can be audited for a nominal fee. 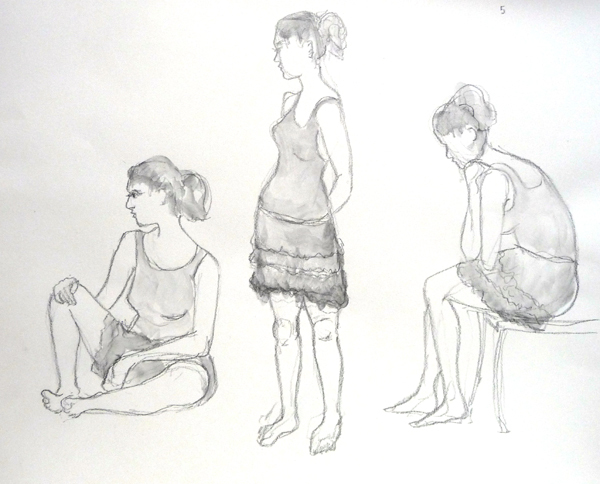 I finally decided to take Figure Drawing I and last Monday was my first class. I used an easel for the very first time and sketched the model on 12 X 18 " paper - both totally out of my comfort zone. But I think I'm going to enjoy it. 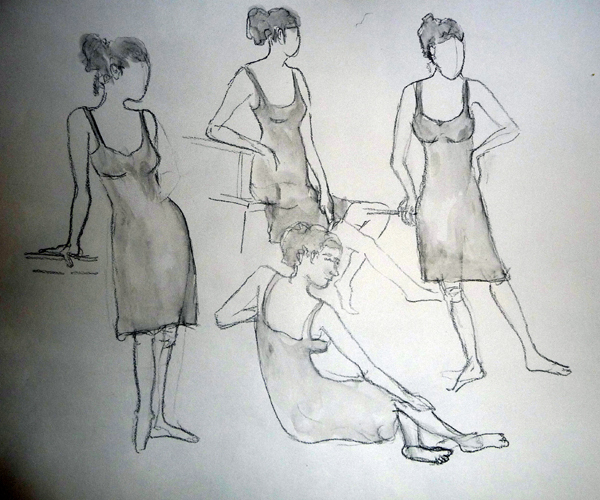 Here are two 20 minute drawings. Next week 18 X 24" paper - YIKES! Thanks Vicki for suggestions on how I could get the background photograph blue tinge changed to white using Photoshop.